Last Friday it was Anzac Day, marking 99 years since the landing at Anzac Cove for the Gallipoli Campaign. One of the enduring military terms from the conflict, still very much in use today, is Digger, to refer to an Australian soldier who has seen active service. More than that, the word is patriotic, symbolising a particular type of Australian-ness that is rugged, resilient, and resourceful. The word Digger has a relatively long history in Australia, dating to the goldfields of the 1850s to refer to miners. Already it had an aura to it, for the Diggers of the Eureka Stockade were a powerful symbol of grass-roots democracy. A Digger was not only tough enough to thrive in the harsh conditions of the goldfields, he was ready to stand up for his mates and resist oppressive authority. Furthermore, the blue work clothes of the miners which were used to make the Eureka Flag were part of the inspiration for the phrase “true blue Australian” – the working man who fought for his rights. How the word became used for the Anzacs is a matter of some debate. It is documented that British commander General Ian Hamilton urged the Anzac leader William Birdwood, You have got through the difficult business [of landing], now you have only to dig, dig, dig until you are safe. This advice was handed down through the ranks, and official war historian Charles Bean believed that it was the troop’s dry sense of humour which led them to refer to themselves as Diggers. Another view is that the word came into use even before Australians reached Gallipoli. A former soldier recalled an occasion when Birdwood addressed the men of the 11th Battalion near Cairo, in preparation for the landings on Gallipoli. Birdwood warned the troops that they had to be good diggers and good soldiers. The soldier insisted that the term caught on from that point, and it seems likely that the impetus to dig and tunnel at Gallipoli made the term more widespread. Australians must have gained a reputation for their digging, because in 1915 it was reported of Australian soldiers in Gallipoli, They are the best trench diggers in the [British] Army. They work like bullocks, fight like tigers … yet are so cheerful and work together like old pals. Although Digger may have originated as a military term at Gallipoli, it first came into prominence in 1916 on the Western Front, possibly following a speech by Brigadier James Cannan, commander of the 11th Brigade, about the digging prowess of the 44th Battalion in the trenches of northern France, who were then derisively labelled the diggers. Many of these men had been miners in the Western Australian goldfields before enlisting, so these miners-turned-soldiers may be a direct connection between the use of Digger for miners, and for soldiers. Digger was already recognised in Australia as a term for miners, and already part of the Australian image. This might explain why Australians so warmly embraced the word, and why it became such a vital part of the Anzac identity. After the war, the word Digger became part of the Anzac legend, embodying the qualities of endurance, courage, ingenuity, good humour, and mateship. Many Australians who had served in the war were nicknamed Digger, and Prime Minister Billy Hughes was proud that he had been called “The Little Digger” by the troops. There was an entertainment troupe of Australian and New Zealander World War I veterans called The Diggers. They went on to make several “Digger” films, which received poor reviews from the critics, but were popular with audiences, especially in rural areas. It was even suggested in Parliament that that the rank of Private in the Australian Army should be re-named Digger. Digger can often be found as a name in Australian records, yet rarely as an official baby name. Digger has been commonly used as a nickname, not only by returned servicemen, but on children as well. Despite this, I could only find Digger on a very few birth records, and each time only as a middle name. (There was a baby in the Birth Announcements with Digger as his middle name too). It’s interesting that while we are apparently very happy to call men and boys Digger, there doesn’t seem much evidence of us putting it down on the birth certificate as a first name. I wonder if parents worry it will seem disrespectful to Australian soldiers or the Anzacs, or if they have even been dissuaded at the birth registry. A little while ago, I received an e-mail from someone who was considering the name Digger for her baby – did they choose the name in the end? I think Digger seems cute yet masculine as a name, and it shouldn’t be forgotten that it can be used as an endearment, like mate or cobber – nor that the word was in use even before World War I. Some may find the name quite heavily value-laden in Australian society, perhaps too heavily. I have read this definition of the Digger: “A man for whom freedom, comradeship, a wide tolerance, and a strong sense of the innate worth of man, count for more than all the kingdoms of the world, and the glory in them.” That’s quite a big meaning for a name to carry, but what a magnificent meaning for your son’s name to hold. Digger received an approval rating of 35%. 28% of people thought it was only suitable as a nickname, but 21% saw it as uniquely Australian. 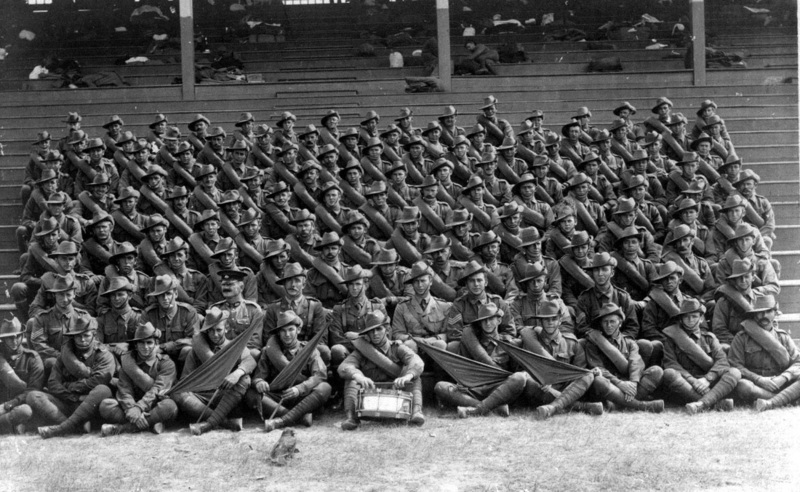 (Photo shows Western Australian miners who enlisted in 1916). I’d be fine with calling one of my boys ‘digger’ if he had the right personality for it but I would never NAME him such. To me digger (small d) is a term like mate, sport, pet, darl and all of those would be strange names to have even if you always are known by them to a particular person. Also there is a very particular image that goes with the name and I think you would be rather boxing your son in with this one. Image if he was the quiet sensitive type, it would be hard to carry off. There is a boy name Dustin (Dusty) on my son’s footy team and that has a similar feel without the problems I think. Duncan also has a similar vibe to me. I love this name. So uniquely Australian.To me it sounds strong, masculine yet friendly. The mining connection is great as far as my heritage is concerned. I feel many would only use it as a middle name or nickname because of the strong ANZAC connection. None of my family fought as Anzac’s so I’d feel uncomfortable using it. I would love to see a little Digger, but I can see why people might be hesitant to use it as the official name.